What experts are consulted during a birth injury case? The number and type of experts that are retained for a birth injury case depends on the nature and severity of the injuries sustained. Generally, the birth injury team at Reiter & Walsh, P.C. 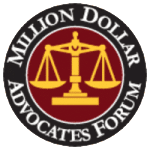 will consult with a number of expert witnesses including obstetricians, perinatologists, high-risk obstetricians (called maternal-fetal doctors), pediatric neurologists, neuropsychologists, physical therapy specialists, neonatologists, neuroradiologists, physical therapists, vocational rehab specialists, life care planning specialists, and economists. These experts, who are among the best in the nation, provide our team with specific, unparalleled experience, knowledge, and skill. Our experts work with us throughout the litigation process to evaluate the case and testify at trial. In order to achieve the best results for our clients, the Reiter & Walsh, PC team believes it’s critical to focus exclusively on birth injury lawsuits. Our tightly-knit in-house legal and medical team works with leading medical experts in the United States to take on and win complex birth injury cases. 100% of our cases are birth injury lawsuits, and most involve infant brain damage, hypoxic-ischemic encephalopathy (HIE), and fetal oxygen injuries, cerebral palsy, C-section mistakes, seizure disorders, intracranial hemorrhages, and more. Within the field of birth trauma litigation, we’ve encountered dozens of combinations of complications, injuries, and acts of malpractice. To begin your free legal consultation with the Reiter & Walsh, P.C. birth trauma team, contact us in whichever way you prefer. Should you qualify, our attorneys will sit down with you to determine the cause of your loved one’s injuries and the negligent party. 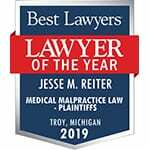 View our video library to see Michigan medical malpractice lawyers Jesse Reiter & Rebecca Walsh discuss causes of and treatments for cerebral palsy and other birth injuries.